I once saw a 1913 map of our area, which shows Elmer Farm, fields, four Coastguard cottages and nothing else. Elmer Sands Estate was still just a twinkle in the eye of the developers. It was not until the 1920s that Farmer Brown let out plots of land to a few people who built small dwellings for weekend use. Later he sold the land to them, along with the rest of the area, which he sold to developers. This is of course a very simplistic account of the beginnings of the estate, the full details of which I shall leave to the experts, but you get the idea. To go back to the beginning, Elmer Farm is of course Manor Farm, which now stands rather sadly beside The Cabin. It was originally a lovely thatched building, but unfortunately it was damaged by storms and then ignominiously knocked down by developers who rebuilt it as a bad facsimile of the original. The Elmer Coastguard Station occupied what is now the site of No’s 2-8 Sea Way, as well as Three Decks, the houses, and their gardens extending across the line of the present road. It appears this desolate stretch of shore was rife with smugglers. As to the history of the name, ‘Almerespol’ is mentioned in a Saxon land charter in 898 AD and again as ‘Elmer’s Pol’ in 953 AD. There is a mention of a fishery in Elmer Pool in a conveyance in 1578, and some people believe that the name Elmer derives from the old English ‘ael’ or eel and mere, meaning pool. Elmer Sands Estate as we know it was started in about 1928 when Mr Stedman purchased a large acreage of land from Farmer Brown. It was later to be disposed of in two portions to developers. The Minister of Agriculture, the Rt. Hon. Walter Guinness, later Lord Moyne, purchased a strip of land to the north on which he planted trees, to screen the proposed new estate from his property at Bailiffscourt in Climping. The first action taken by the developers was to map out the estate and construct the roadways; the next was selling the plots for buildings to be erected on them. This was put into the hands of a Mr Carter, who had difficulty in selling them owing to the lack of builders available. His answer was to set to work and build them himself. Of course at that time there were no public services such as sewers, gas, water and electric lights, so the residents had to rely on cesspools, paraffin stoves and pump water. The niceties of modern living came a lot later. In 1931 a major disaster occurred: a high tide coupled with southeasterly gales breached the sea banks and a large part of the estate was flooded. As a result an association was formed to maintain defences there and a timber barricade was built. All the owners agreed to pay the cost of repairs and from this time a small committee with limited funds was always in existence to keep the common areas in good order. 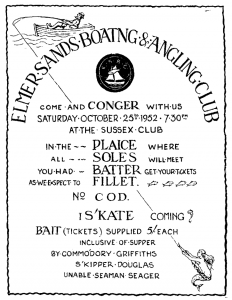 In December 1935 a large meeting was held in London and it was decided to create a limited company, Elmer Sands Association – the name was changed to Elmer Sands Limited in 1995 – to which all owners should belong. Limited liability was set at 5 shillings with an annual membership fee. Thus the estate was formed on 20th March 1936 with a council of fifteen in charge of the maintenance of roads, open spaces and sea defences. Their first thought was sea defences, and a scheme was prepared for the erection of a wave screen for the full length of the estate. By the commencement of WWII it was complete except for a length in front of the boat club. One of the largest attractions in the area was the ‘New City’ created by Sir Walter Blount, Bt., and opened in 1922 in the former seaplane factory south of the church (now Saxon Reach Estate). It was one of the earliest attempts to provide a self-contained environment for enjoying the seaside. One of the hangars accommodated a dance hall and another, indoor tennis courts; there were also outdoor tennis courts, a putting green, and rooms for cards and billiards. 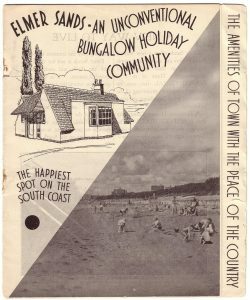 A less exclusive alternative was the Elmer Sands holiday resort, which existed by the early 1930s, offering similar sporting facilities. 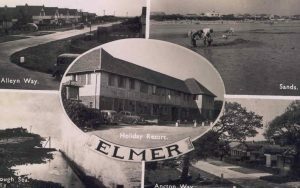 It was burnt down at one point but rebuilt to include a swimming pool, surviving until the 90s when it was turned into flats and renamed Elmer Court. Almost at the start of the war the Canadian Troops came in and practically took over the estate. The whole of the foreshore was made a no go area for everyone; rows of scaffolding were erected, as well as concrete blocks and rolls of barbed wire at the top of the bank, and slit trenches to stop enemy landings. By the end of the war the estate was in a mess. This was potentially a problem because the Government had made no provision under the Defence Act, to make good private estates. Eventually with great determination the association made an agreement with the Government for reparation and in the course of time the works were completed. On 24th November 1949, the Coast Protection Act came into force whereby certain duties of coastal protection were placed in the hands of various authorities, but it was not until 6th February 1957 that Chichester Rural District Council came to an arrangement with West Sussex River Board to take over the sea defences facing Elmer Sands estate. Around about that time the Association purchased from its owners the field in the centre of the estate known as the Riding School – it had at one time been used as such but had fallen into disuse. For a while the field and the stable were let out and a small proportion was used as an estate yard, the idea at the time being to develop it later with tennis courts and a bowling green. Eventually, however, it was sold for development and is now the area known as Stablefield. Over the years there have been regular instances of flooding in Elmer Sands, but in November 1984 and April 1985 far fiercer storms caused havoc along the south coast. It was the worst flooding that had ever occurred on the estate, many residents in Manor Way were forced out of their homes. It was apparent that a solution to this danger, other than just heaping more shingle on the sea wall, was needed. The National River Authority worked with Arun District Council to provide a solution. The schemes most striking feature was eight rock islands built offshore to break up the pattern of waves hitting the beach. It cost £5.5 million and was finished in September 1993. Today ADC is responsible for Low Line areas of defence and the Environment Agency High Line i.e. sea walls. Since the formation of ESA a very successful Boating and Angling Club has been established; this greatly added to the amenities of the estate. As well as organising countless events on the sea it branched out into organising social events. They have organised old time dancing, club dinner dances, the putting green, Regattas, fetes, the hog roast, Guy Fawkes Night, and in more modern times Halloween. Now adays the club centres around that for which it was originally formed sailing and fishing. Another amenity that has been added in recent years is a toddlers and small children’s playing area at the side of Three Decks, named Clancy’s Garden after a resident’s wife who’s tree stands in the area. Volunteering residents carried out most of the work; i.e. the design, planning and hard labour. It was opened in 2001 along with the ‘sports field’, formerly the putting green. This area for older children contained a football pitch with goal posts and a basketball ring, the hard court being added later after one of the council secured an award from the lottery fund. The final jewel in the crown was the completion of the Jubilee Garden at the site known formerly as either the ‘Kiosk’ or the ‘Weather shelter’, which was opened to celebrate the Queen’s Golden Jubilee on 3rd June 2002; again, volunteering residents did most of the hard work. In the early days of the estate a small shop selling tea, ice creams and food, with toilets either side was housed in the building. It had closed in the 70s due to costs and health and safety. The estate has gone through a lot since its inception, including hurricanes, droughts, flooding, and a World War. Many things have changed over the years; houses are bigger, there are more cars, and we are not a community of holiday homes anymore. We also now employ a Secretary and a Treasurer. But we still shape our own destiny; the estate is still run by fifteen elected residents, the subscriptions we pay along with the help from those volunteers as well as others facilitating the upkeep of the open spaces, roads and drainage. All those men and women who have freely given their time throughout the years deserve our thanks – their work has ensured that Elmer Sands is the solvent, well maintained, and most of all, attractive place it is today! Please contact the secretary if you have any corrections or further information.